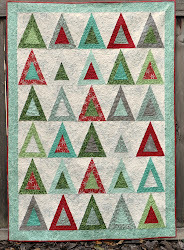 Natalia is hosting a Homespun Holiday Show -n- Tell over at her site, Piece N Quilt. I'm getting my entry posted at the last minute, but at least I got it done! Don't forget to head over to her site (click the image above) to see all the other entries. I got my daughter's stocking done, it's the one on the right. 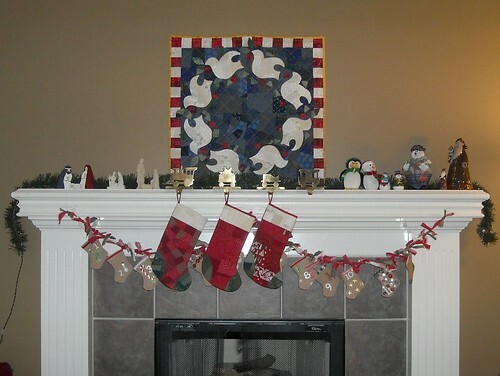 The one on the left was made in 2002 for Daniel, in the same time frame that the Wreath of Doves quilt was started. I made Jacob's stocking in 2006, when he was 2. I used the same pattern for all 3 stockings and I took photos this time, hoping to make a tutorial to share with you all. It turns out I'm running out of time and I'm thinking I will probably save it and share it for some kind of Christmas in July blog event next year... what do you think? Do you even want to think about next year's Christmas yet? Here's a little closer view. Can you see the loopy quilting I did in the white cuff part of Lauren's stocking? I like it. I wrapped almost all the gifts last night. Just one more. I'm going to make some recycled loopy bows today like this. Aren't they cute? And I still have some stealth sewing to fit in....we'll see how that goes. p.s. my husband painted the living room--I really like our new color! 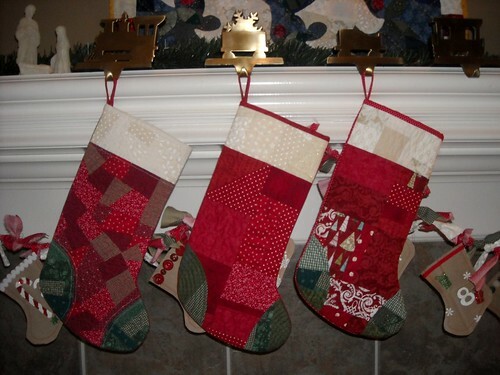 The stockings are beautiful! Can you tell me more about the smaller brown ones--looks like there are 12? I'd love to see a tutorial in January since I am hoping to sew stockings in January! The new wall color is so nice! Your stockings are great!! I love the whole look of your mantle! I love the stockings hung by the chimney with care. They look very festive with the quilt.